This punny 15 oz. 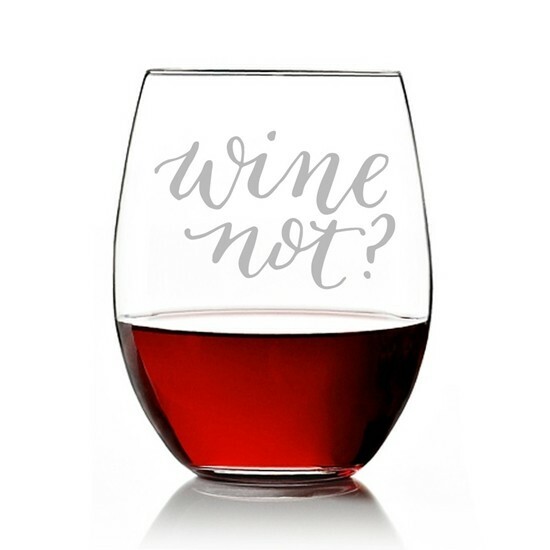 stemless wine glass features an engraved "Wine Not!" design in the on-trend Wanderlust script font. Highest quality engraving of the design produces a permanent frosty white effect. Non-personalized. Dishwasher safe. PLEASE NOTE: While we package all personalized glassware with extra care, we cannot replace any glassware that may break while being shipped by UPS or FedEx. It's always a good idea to order extra quantity (5% is the rule of thumb) to account for shipping damage or unexpected guests.